And a fantasia it was! 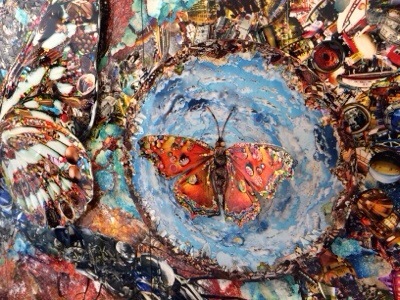 A dizzying psychedelic world bursting of colours and butterflies to mesmerise the audiences! 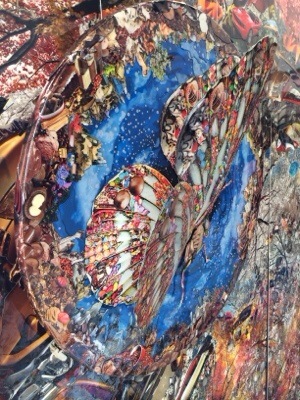 View of Gallery: Wall-to-floor covered in abject art. 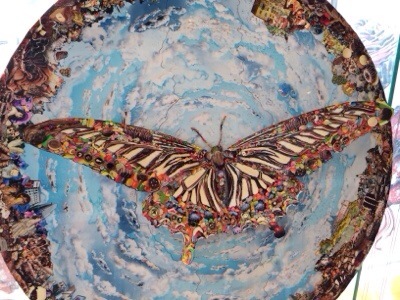 Crossing the boundary from 2-D to 3-D, leading the audience to enter the artist’s fantasy world. 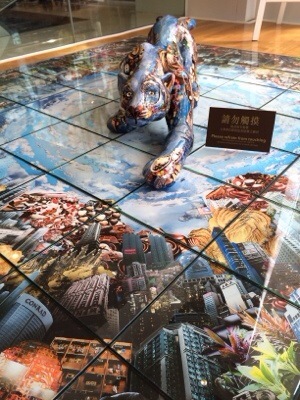 This is a solo exhibition by renowned Korean contemporary artist Jang Seung Hyo who conjured up a surreal chocolate world in conjunction with the annual Chocolate Trail 2014 in Harbour City. 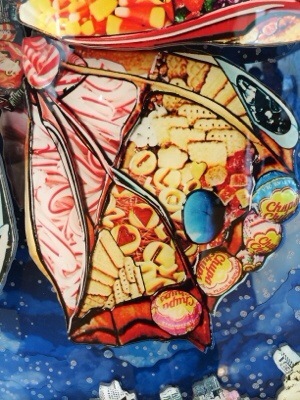 His created a chocolate fantasia through collages by juxtaposing images of chocolates and sweets. 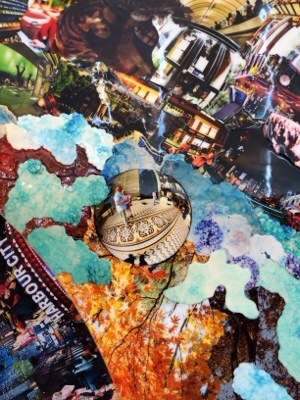 Thus, transforming the 2-D photographic images into 3-D art pieces. 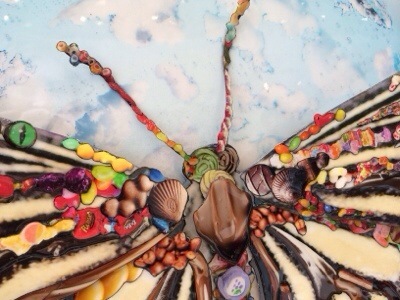 I see Guylian chocolates Smarties and Jelly Beans, do you? 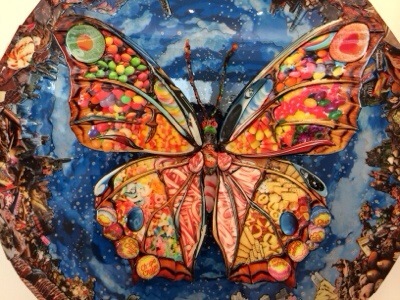 Try as I did, it was hard to photograph with my iPhone because it was very colourful and I’m at loss at which angles, details and how to capture the artworks as they were all too beautiful! If you are in Kowloon, grab your camera and do me a better job! 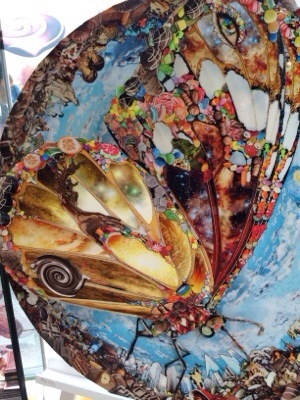 This entry was posted in Art, Exhibition, Hong Kong and tagged Chocolate Fantasia, Chocolate Trial 2014, Harbour City, Hong Kong, iphonography, Jang Seung Hyo. Bookmark the permalink. Haha! These are not made from chocolates! 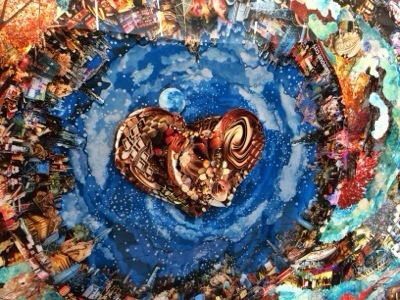 Actually a collage of photographic images that are connected to chocolates and all things sweet! I asked the lady at the reception desk whether these are all made of chocolate while I went there today. 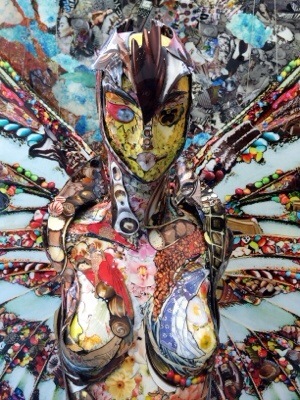 She told me the artist incorporated the idea of chocolate into the art works. Very stunning when viewing the real 3-D works!! 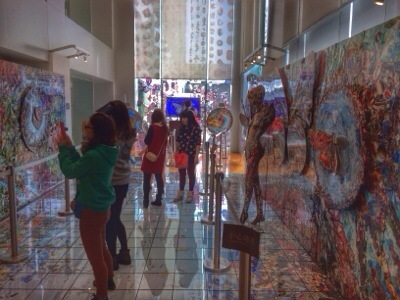 The title of the exhibition is slightly misleading, at first I thought they were all art works made from chocolates – when I first entered the gallery, I was expecting to be overwhelmed by chocolates, but apparently the artworks were only assemblages of images made into 3-Ds! Clever!